The Brookside Hotel grew in a haphazard way manner from its very beginning. In 1936 my Grandfather, Isador Friedman, came across a small farm in Kerhonkson, actually not in Kerhonkson, but in Granite and the Brookside Hotel was born. There was a single building, the original farm house, which had a kitchen, multiple bedrooms and a porch. In 1937, he built several outdoor showers so that the guests could clean up after swimming in the brook that ran by the property, hence the name The Brookside Hotel. He built a cement dam across the brook and had a wooden spillway he could remove whenever he wanted to lower the water so the leaves and silt could be cleaned out. This had enlarged into a swimming area. Activities were needed, so a handball court was built near the pond so people could sit, swim, or play all in the same area. 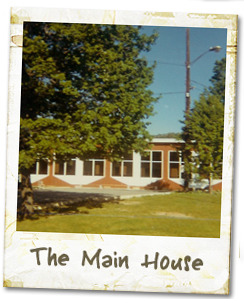 About 1940 the first ‘Main House’ was built where there was a larger kitchen, dining room, lobby area, porch, and seven rooms above on the second floor with an attic. It was near the original farm house but higher up on a hill and overlooking a larger field. During World War II not much happened. My father decided to try his hand at farming so chickens and cows became permanent residents of the hotel. Along with the animals came the Red House, built as a chicken coop, but after the war turned into rooms for rent. Of course outdoor showers were included by the Red House. In 1951, my father designed and built a major renovation project of the Main House adding more space to the dining room with a new lobby area and office desk. It had a large patio out front of the building for sitting in the sun and watching people arrive and depart. The kitchen was expanded with a bake shop so that more food could be prepared and the ‘quality’ and ‘quantity’ of the hotel experience could improve. In the lobby area my father started to show his flair for design, using plywood cut in free form curves to make ‘clouds’ that covered the indirect lighting he wanted to use. It was also the time that my father ‘bought out’ my uncle and grandfather and became the official owner of the hotel. Now that the hotel was my Dads there seemed to be a change every year. In 1953 he built a small building near the old swimming pond for the Day Camp. The camp building later became staff bedrooms for the kitchen workers, but that was many years later. The big spurge in building was to start in 1955 when my father built a large building termed the Casino that had multiple uses, recreation on rainy days, entertainment and shows, a concession area for candy, ice cream and cigarettes with a real soda fountain, and whatever other use he would need. Next came major projects to add rooms and amenities in 1956; the outdoor swimming pool and the Vacationer building. Now the hotel had more rooms to rent out, and financially a little sounder. A small house that was owned by the Dales that was located right in front of the Main House, but down a hill was bought and converted into four rooms, two with private bathrooms and two that shared a bathroom, the semi-private. My parents named it the Trachman Cottage after cousins who had helped my grandfather buy the property on the first place. 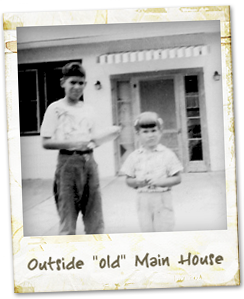 In 1959 my father added eight more rooms, by building a separate building was built, named after my grandfather, the Isador. This only had rooms with private bathrooms. Several years later he added a second floor with ten more rooms, and a year or two later added a room in the lobby area of the Isador. One could never have too many rooms. The nature of the industry and of the Catskills was changing and people wanted more activities in addition to being out of the city. A few small projects had to be completed that included a tennis court, a base ball field, a new handball court and the like to give guests something to do other than eat were finished. The only major building that occurred after the Isador building was the result of fires that damaged or destroyed the Main House. In 1960 a small fire damaged the attic of the building, but no major reconstruction was needed. However in 1962 during the Passover holiday a fire started in the bake shop that destroyed the whole building. Later I will write more about that fire since I happened to be asleep in the attic of the building when it started. Suffice it to say that it started a chain of events that resulted in a new Main House built within 3 months, the addition of an indoor pool in 1965, a second floor added with rooms a few years later and the completion of the No Name Room, our nightclub in the basement below the dining room after that. I remember watching Nixon’s resignation on the TV in the “lower Lobby” with a whole group of people. Even though I was 11 years old at the time, I knew it was a really big deal. We spent many summers there with our kids and they went to camp. We also use to get away for a weekend during the year. Our Family use to go there from generation to generation…There were three generations of our family that went to the Brookside. We loved staying in the motel Rm 22…. We had all our friends there and we use to meet there.